2) What do the latest minimum wage changes mean for your business? 3) Summer comes with its own set of special human resources issues. Are you ready? Are you ready to get your company policies in order? Start with this free employee handbook template from NFIB. 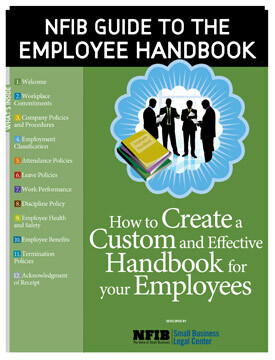 Even the smallest business should have an employee handbook. Putting your company’s policies in writing can help protect your business from disputes and lawsuits. Developed by the NFIB Small Business Legal Center, this handbook is your blueprint for creating an employee handbook that works for your company.